At London Osteoporosis Clinic any drug treatment is only as part of holistic care. And drugs are tailored to the needs of the individual patient. 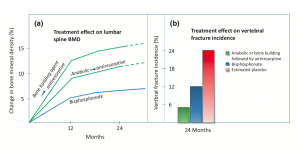 and on vertebral fracture incidence in postmenopausal women with high fracture risk, defined by previous vertebral fracture and low BMD (b). Placebo estimate is based on a 50% relative risk reduction with per oral bisphosphonate therapy. Bisphosphonates – There are several different kinds of bisphosphonate. Some are taken by mouth, while others are given by intravenous injection (a slow injection into a vein). Pamidronate, ibandronate and zoledronate are all types of bisphosphonates. Teriparatide and parathyroid hormone – These help regulate calcium levels in your blood. They come in a ‘pen’ syringe and are injected under your skin. Read more about teriparatide and parathyroid hormone. Denosumab – This is used for postmenopausal women who can not take bisphosphonates and in men who develop osteoporosis as a result of treatments for prostate cancer. Raloxifene – This is used to treat spinal osteoporosis in post-menopausal women following a fracture. It is given in a tablet form and taken daily. Calcitonin – This is not used in the UK, only available as an injection to cut pain from pelvic and vertebral fractures in the time shortly after they occur. It should only be used for a most of 4 weeks. Strontium ranelate – This is taken daily at least 2 hours before or after food. It comes as a powder which you mix with water. 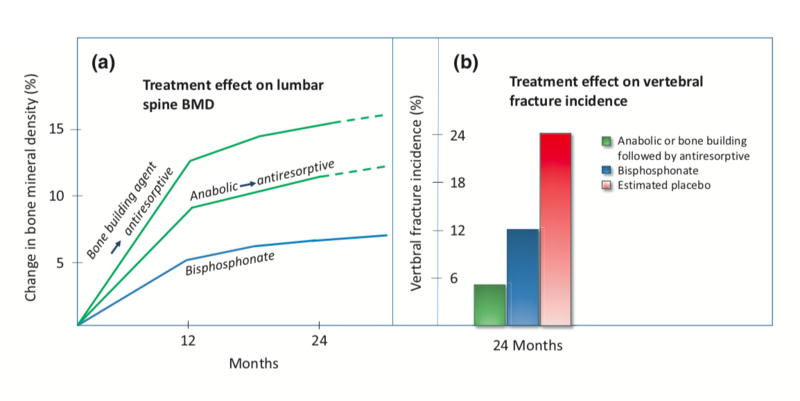 HRT – is mainly used as a short-term therapy for early post-menopausal women with increased fracture risk who have troublesome menopausal symptoms. Calcium and vitamin D – Not getting enough calcium and vitamin D can increase your risk of fractures. You usually require supplements to help cut your risk and to promote better responses to other treatments for osteoporosis. Read more about calcium and vitamin D.